A – The top panel protects the main hardware and replicates status LEDs. CAn be easily removed if space is an issue when integrating in your programming/testing system. B – A built-in timekeeper/calendar allows for detailed, timestamped logs. Production problems can thus be traced back to the exact moment they happened. C – Flashrunner uses a standard, removable Secure Digital card (up to 2GB) to store binary image files, projects and log files. D – Mounts easily inside ATE and test fixtures. Compatible with Agilent, Teradyne, SPEA, Genrad and other systems. E – The connection layer provides connectors to interface to your programming/testing system. Includes optoisolation circuity and an Ethernet connector to interface to a host system. 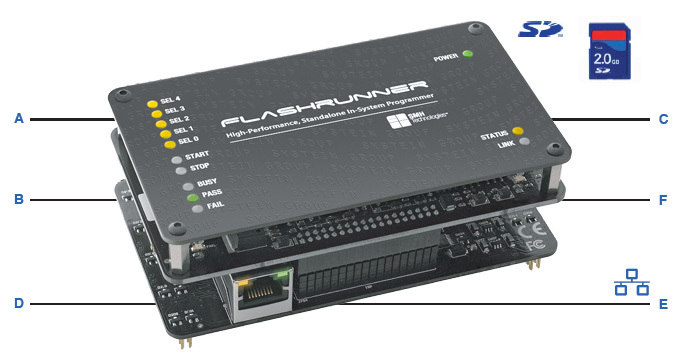 F – The programming engine layer (common to all Flashrunner Series instruments) contains all of the Flashrunner electronics in a compact footprint.